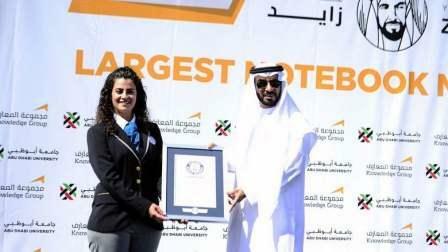 The Abu Dhabi University (ADU) and Knowledge Group (KG) entered the Guinness World Records for creating the largest notebook mosaic logo in celebration of the Year of Zayed. The record-breaking initiative also coincides with the UAE National Month of Reading that is annually marked in March. The ADU executed and received the recognition for its record-breaking effort - one of the several initiatives announced as part of its Year of Zayed Strategy 2018 - at a special ceremony at its main campus in the Capital. The ceremony drew the participation of Ali Saeed bin Harmal Al Dhaheri, chairman of the ADU's executive board, and the wider ADU community. A Guinness World Records representative witnessed and documented the achievement. Earning the university its first-ever Guinness World Record, the notebook mosaic of the Year of Zayed logo measures 702.82 square metres and is made up of 25,000 notebooks. All 25,000 notebooks will be donated to people in need. Speaking on the occasion, Al Dhaheri said: "The Abu Dhabi University is proud to have set the Guinness World Record. This is indeed a special milestone for the university as we celebrate the Year of Zayed and values of the founding father of the UAE, late Sheikh Zayed bin Sultan Al Nahyan. We dedicate this record to the memory of Sheikh Zayed as our small tribute to his immense contributions as a statesman, humanitarian and true visionary of his time."